A YEAR OF JUBILEE REVIEWS: Turbo Racing League app and a Chance to Win a Camaro! Turbo Racing League app and a Chance to Win a Camaro! 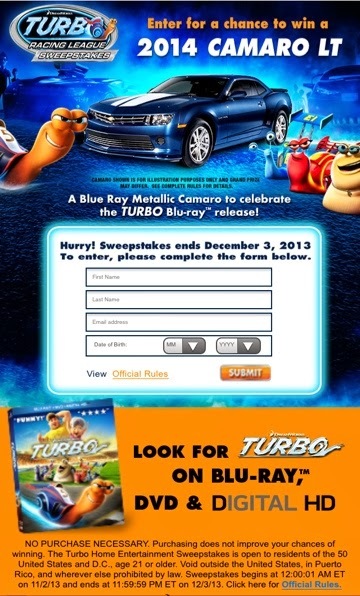 Fox Home Entertainment is launching the Dreamworks animated movie Turbo on Blu-ray/DVD on 11/12 (Digital HD was made available on 10/22) and to celebrate, fans now have a chance to win a brand new 2014 “Blu-ray Blue Metallic” Chevy Camaro. (See the fun in the color's name!) Starting this week, the top-selling Turbo Racing League app will play host to a four-week tournament where players will have a chance to win a free Digital HD download of Turbo. 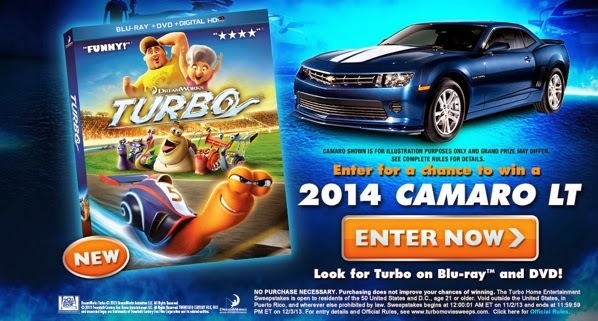 One lucky grand prize winner will win the 2014 "Blu-ray" Metallic Camaro LT with white racing stripes, valued at $30,000 (picture below). · 2 brand new film racers — users will now be able to play as Turbo or Whiplash! If you aren't one of the 30 million, you can download the app here and join in the fun!